Banana & Peanut Butter Toast Towers! 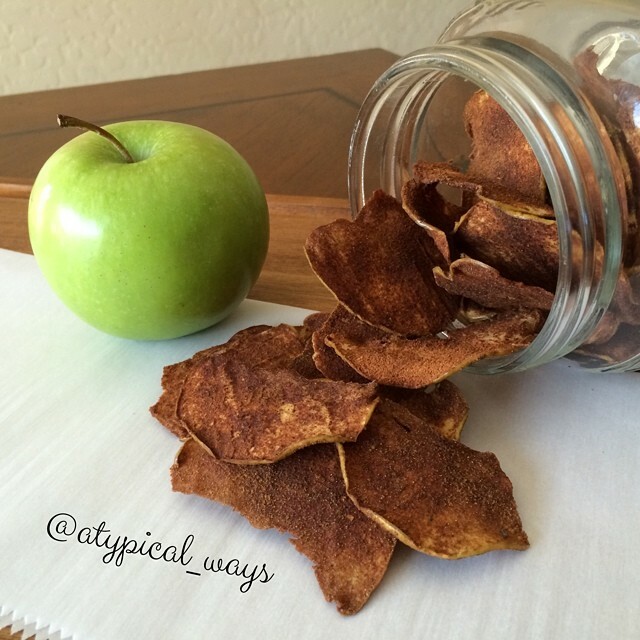 Fun kids food doesn’t have to be complex! Banana & Peanut Butter toast towers for my little guy this morning! 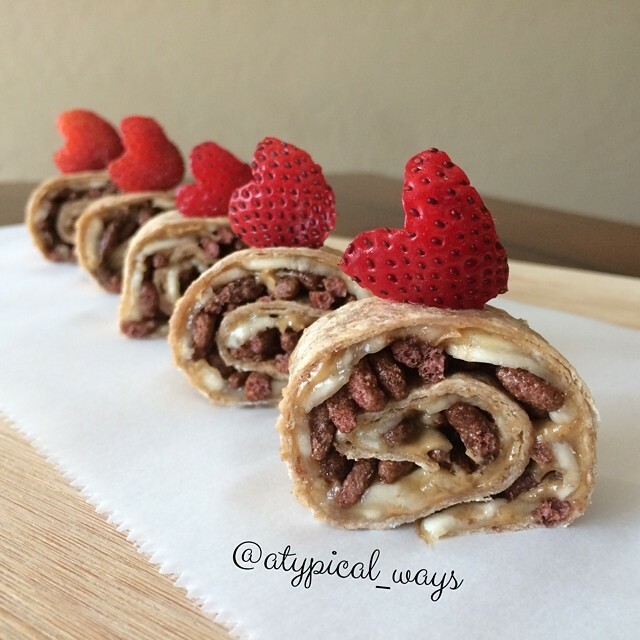 Simple ingredients just made a little more fun & exciting by stacking them! 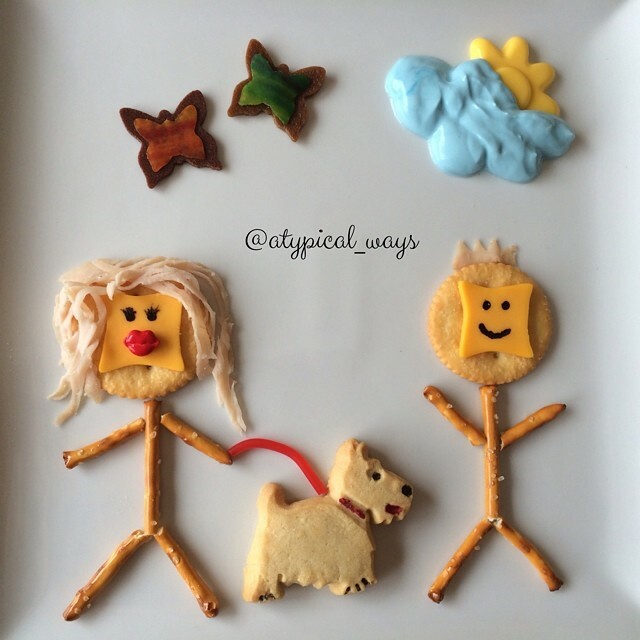 Fun kids food doesn’t have to be complex! I used a round cookie cutter to cut the circles out and then toasted them in the toaster. 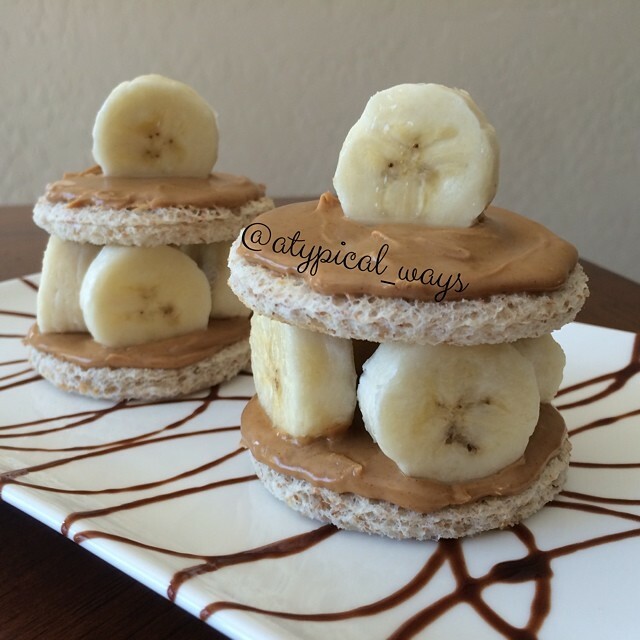 Add some peanut butter to the bread and thick banana slices and VOILA, fun little towers. P.S. – save the crust/cut off bread in zip lock bags in the freezer for using in other recipes as bread crumbs, etc. We also use it to go feed the ducks at the park! 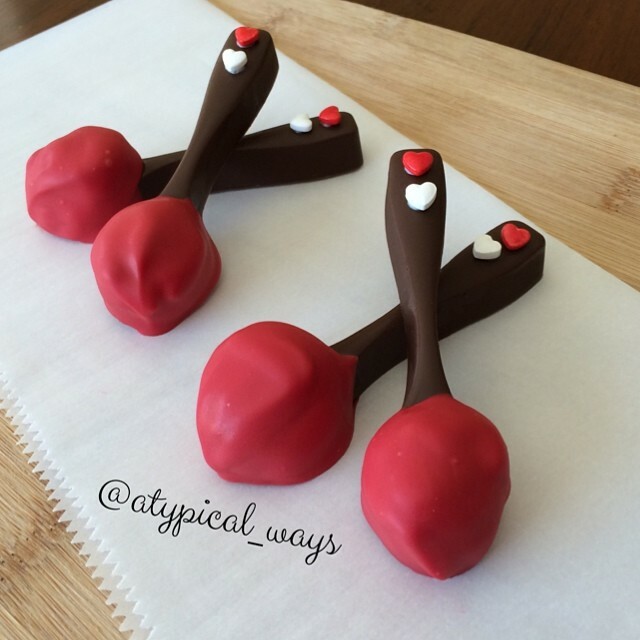 Chocolate spoons scooped in Peanut Butter & dipped in more Chocolate! So everybody has seen those plastic spoons dipped in peanut butter and then covered in chocolate floating around the Internet. Well, we just took it to another level at our house! The spoons are made out of chocolate! I filled it with melted chocolate and then place it in the freezer to set. After I took the spoon out of the mold, I scooped up some peanut butter with it and then dipped it in red melted chocolate. Next I placed them all back in the freezer until it was time to eat them. YUM! The sun was made with yellow chocolate & a Wilton mold from Michael’s that was $1.99. I cut it in half and the clouds are made from vanilla greek yogurt & blue food coloring. The butterflies were made with fruit strips and small fondant cutters. The people are made with pretzel sticks & Ritz crackers. The faces were made with cheese that I cut with a small fondant cutter. I drew the eyes on with black food coloring & a tooth pick. The hair is made out of sliced deli turkey. The females lips are a piece of candy. 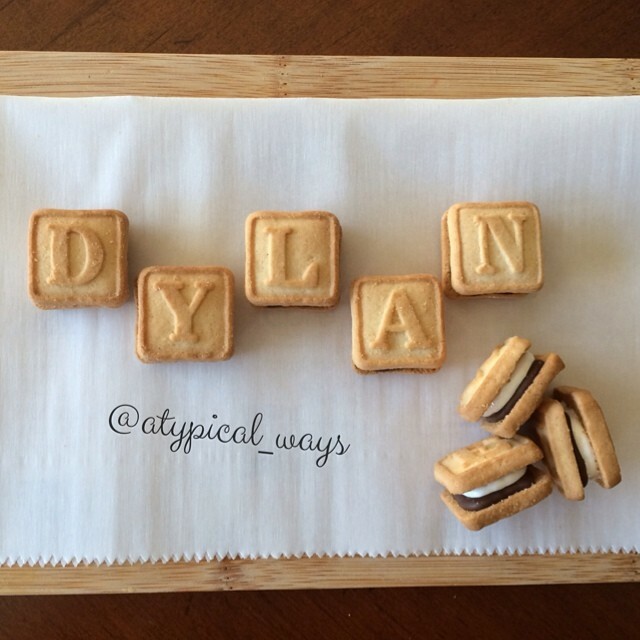 The dog is a ‘Walkers Shortbread Scottie Dogs’ cookie that I used a little red/black food coloring on. The leash is made from a candy rope. 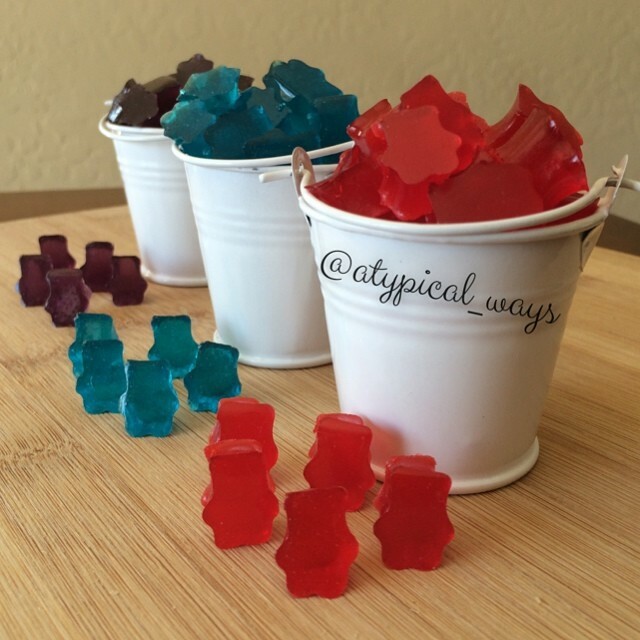 Super easy homemade Gummy Bears! Perfect kid friendly activity for the summer! I used a tiny teddy bear cutter that can be bought on Amazon here! This little silicone tray would work perfect too! Place the cold water in a small saucepan that has not been on the heat yet. Sprinkle the unflavored gelatin into the water and lightly whisk. Allow the gelatin to bloom for a minute or two and then add in the flavored Jello. Slowly heat the mixture over medium low heat, whisking often until the jello is completely dissolved. It should be a smooth liquid mixture now, not gritty. Remove from heat and pour into glass measuring cup so that you can either pour into molds or into a baking dish for use with small cookie cutters. The size of baking dish will depend on the thickness that you would like your gummies to be. And then I either place in the refrigerator or freezer until set. I found that it only took about 5-10 minutes to set in the freezer. I peeled the mixture out of the glass baking dish that I used and placed it on the counter and Dylan and I went to town cutting out little bears!